Our light therapy devices reach all the layers in the skin, from our hair follicles to our dermis. 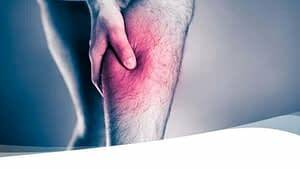 It creates a biochemical effect in our bodies that renew the production of collagen, elastin and other cells in our body. 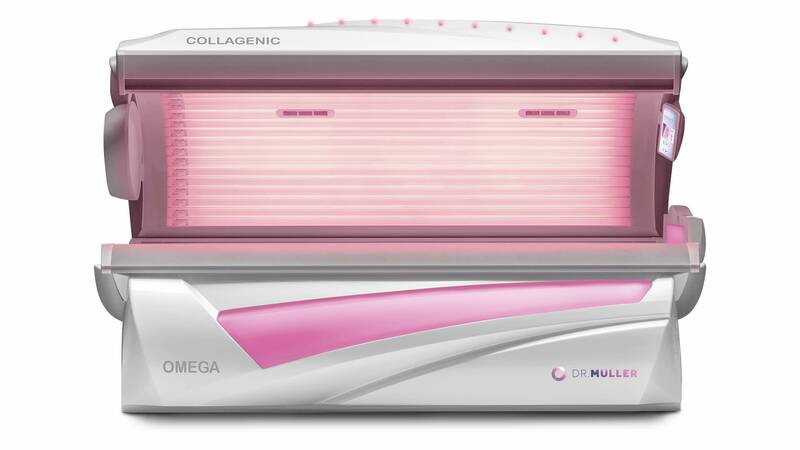 The Dr. Müller Collagenic Machines and Beauty Light Therapy are natural light therapy devices that are equipped with either red or red, green and blue light lamps. Having a Dr. Müller device, whether a lay-down or stand-up, in your location, provides you with many opportunities. For each of these branches, we will give advice about which device will suit best, plus we will list the benefits and sales opportunities for the specific branch. What is more relaxing than doing absolutely nothing? Enjoying a light therapy session that makes you feel at ease while listening to calming wellness sounds. Or, perhaps even better, your favourite songs. After completing the first session, you will feel rejuvenated and your skin smooth and tight. 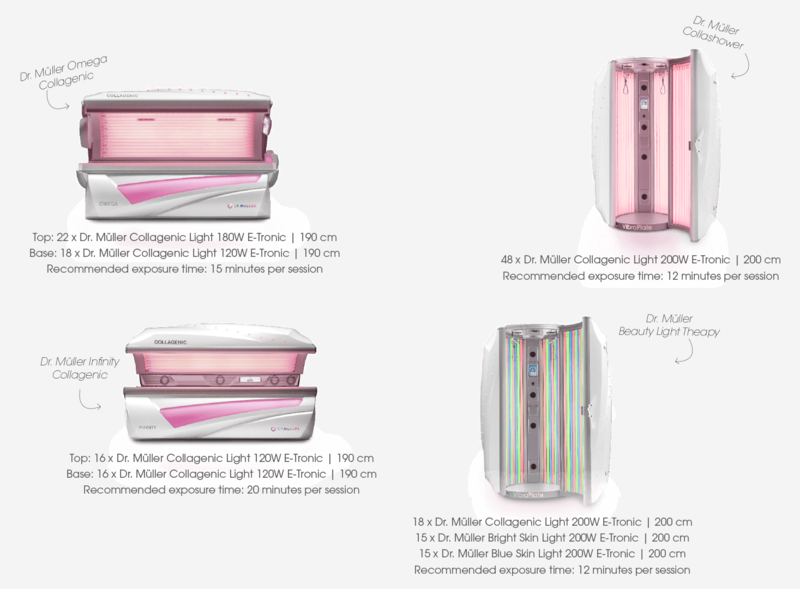 The Dr. Müller light therapy devices are truly an innovative addition to any wellness and spa centre, due to its beauty and health benefits. Oxygenation and detoxification of the skin, reducing deposits of cellulitis, increase wound healing, and overall visible anti-ageing are only a few of the benefits that your customers can enjoy. A light therapy session in a Collagenic lay-down or Beauty Light Therapy device, is the perfect way to complete a fitness session. Nothing will feel better than giving your body a well-deserved rest while laying down and rejuvenating. The light therapy session will cool you down after an intensive work-out routine. The device’s lights emit energy which your body uses for the recovery process to feel fit again. Furthermore, it smoothens the skin, which you will feel after only one session. With long-term and frequent usage (2-3 sessions per week, for five or more consecutive weeks) users will notice the rejuvenation effect. Also, your complexion will improve when combined with a healthy lifestyle (non-smoking, healthy diet, enough sleep, etc.) A healthy lifestyle is the number one reason why people go to a gym. Easier said: A light therapy session completes a work-out. A Dr. Müller Collashower or Beauty Light Therapy device can also be used for warming up before you start your work-out. Especially in combination with the Active program on the VibraPlate. This option increases your blood circulation and any stiffness will disappear. 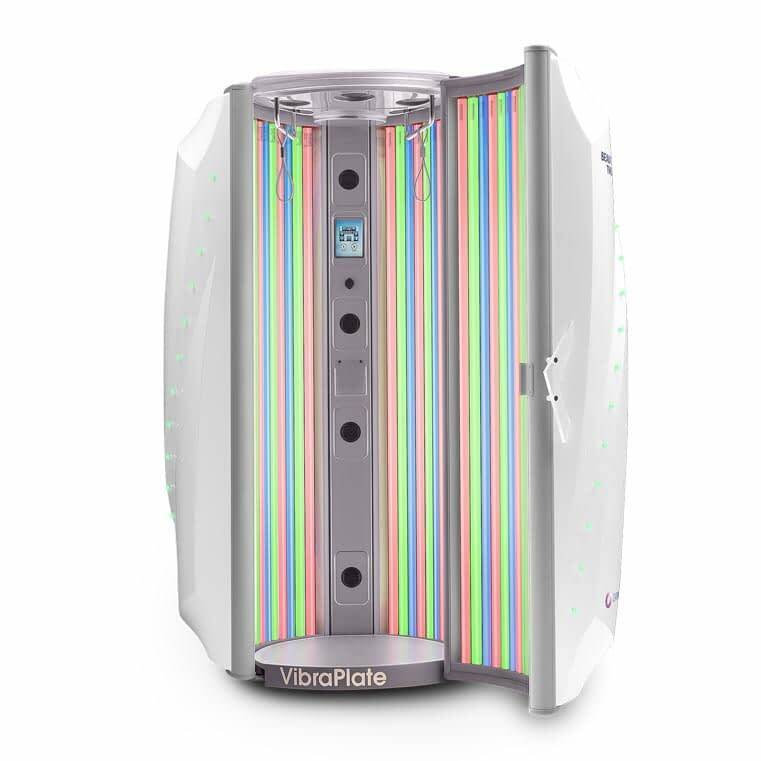 You can put the stand-up light therapy device in the changing rooms of your fitness studio, or equip the device with a Changing Cubicle, so you can put it anywhere and still guarantee the privacy of your customers. As a professional light provider owners of tanning studios are able to recharge customers with the energy that light releases. With the energy of the Dr. Müller light therapy devices, your customers can keep their energy levels in balance. It can be interesting to add either a Collagenic or Beauty Light Therapy device to your studio, whether this is a lay-down or a stand-up Collagenic machine. 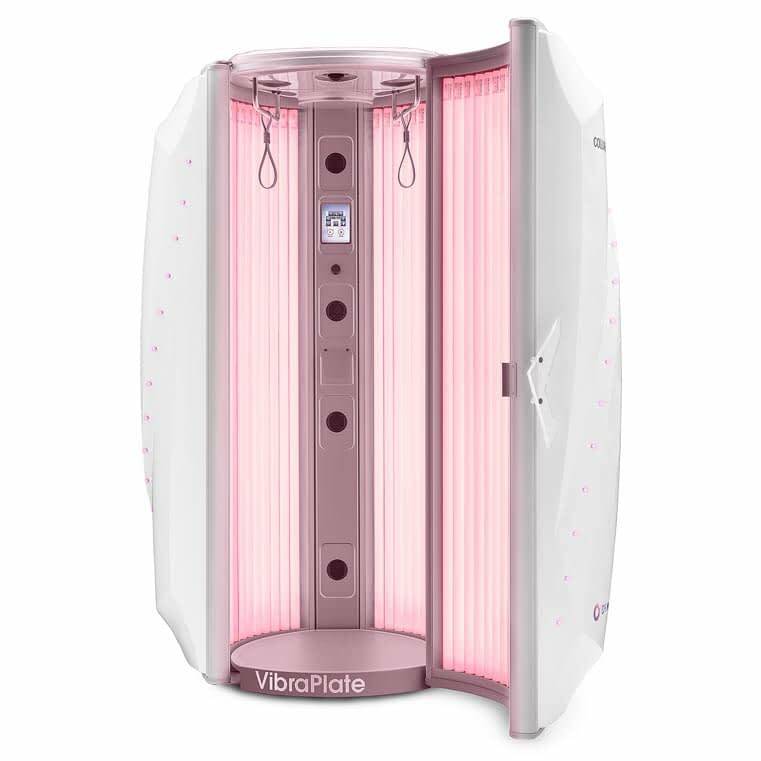 Because the light therapy devices focuses on different target group, this could attract new kinds of customers to your tanning studio. 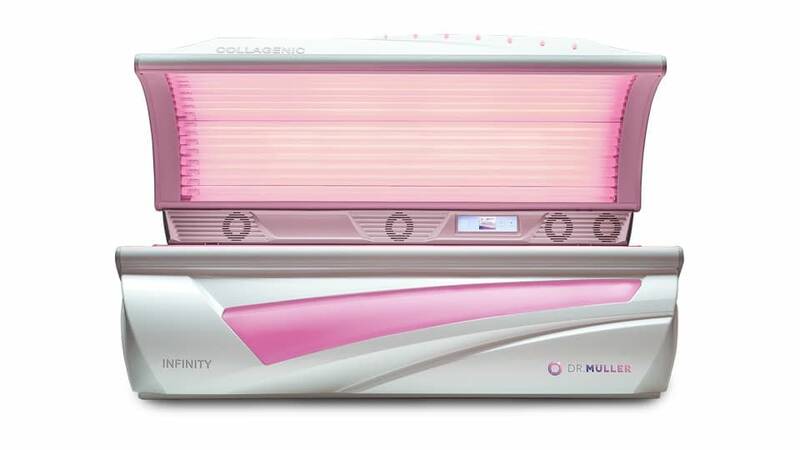 For tanning customers, we recommend enjoying a light therapy session after every two tanning sessions. 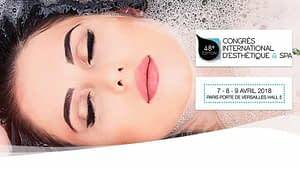 Simply because of all the proven beauty benefits, people go to a beauty salon to have an improved, healthier, and more beautiful appearance. 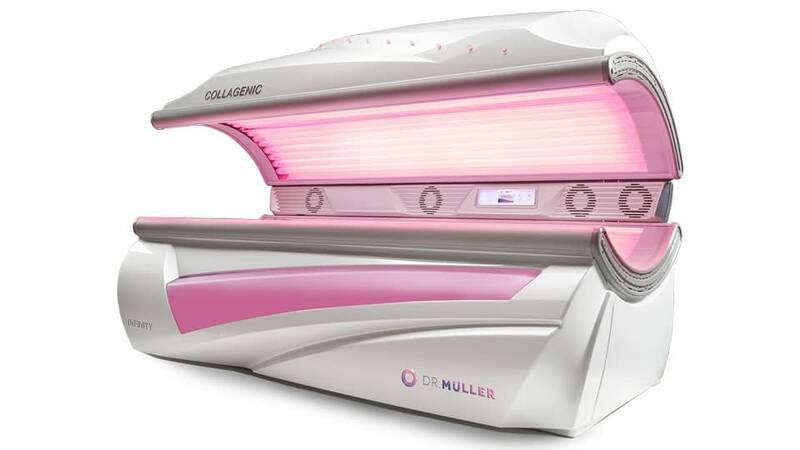 With benefits such as fewer skin spots, decreased cellulitis and visible anti-ageing, the Dr. Müller light therapy devices are perfect for every beauty salon. 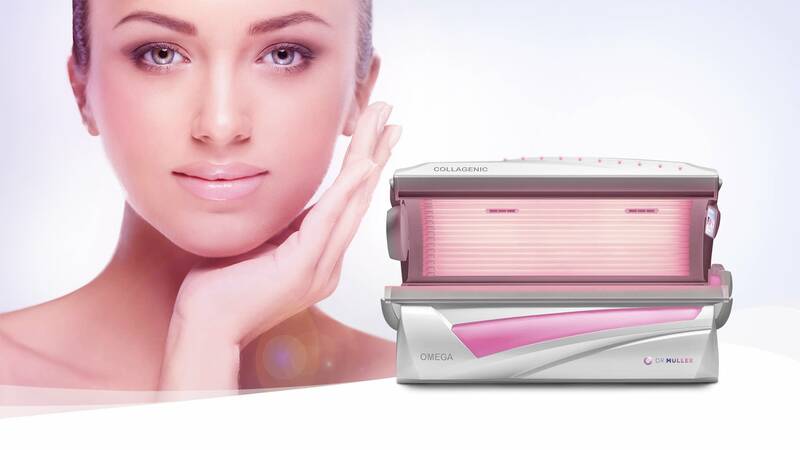 Before starting a facial beauty session, the lights inside the device prepare the skin of your client. Your clients’ skin will be warm and pores will be open, so a facial cleaning treatment – like peels, facial waxing and moisturising treatments – will have more of an effect. Your skin will react and boost blood circulation, through which oxygenation and detoxification of the skin will be increased. And the renewal of collagen and elastin cell production will cause fine lines in the skin to disappear and wrinkles to become less visible. 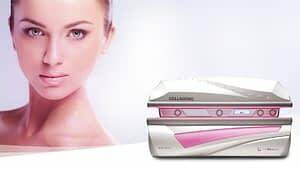 The Dr. Müller light therapy devices encourages your skin to restore its youthful radiance and appearance, which results in visible anti-ageing. Want to offer your hotel guests a pleasant, comfortable and relaxing stay? The Collagenic Machines and Beauty Light Therapy will do just that. They will relax and enjoy a little “me time” while they revel inside the light therapy device. The perfect way to take care the body, mind and soul. For business guests, a single session is a perfect way to unwind after a busy day filled with meetings. On their break, they can enjoy a relaxing light therapy treatment. During a session, they will re-energise while listening to their favourite songs and bask in refreshing aromatherapy with cool water breezes. This one-of-a-kind session will enhance the wellness experience even more. For holiday guests, a light therapy session is a perfect way to rejuvenate, brighten and smoothen their skin. The light seeps into the skin and gets rid of cells that give the skin a dull and aged look. At the end of their stay your visitors will look and feel younger!